The Cricketers Arms01484 682993 work Public HouseThe Cricketers is a CAMRA award winning real ale pub situated in the village of Horbury. Built in 1898, The Cricketers is a red brick typical Victorian building with timber frame frontage to the third storey. The pub passed from Melbourne Brewery to Joshua Tetley in 1960. By the early 1990’s it had passed to Century Inns and finally to Enterprise Inns. 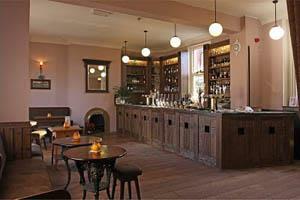 The pub reopened with the current owners in November 2010, renovated to a very high standard. The exterior was re-badged using an Arts and Crafts lettering which was used in the foundation stone. The pub’s connection with Melbourne Ales was emphasised by using the famous bowing courtier symbol in signage and in the ground floor windows. It features a beautiful oak bar, which was designed to match an Arts and Crafts German dresser found in a design book and solid oak floor boards have replaced carpets. The windows behind the bar have been exposed and restored with one featuring stained glass with arts and crafts lettering. Stained glass was also put in the windows of the internal doors using a pattern found elsewhere in the building which is thought to be original. The pubs passion is real cask ale supporting new and established local micro-breweries. On the bar you will find 8 real casks ales, 2 permanent: Timothy Taylor’s Landlord & Black Sheep and 6 rotating guest beers, including one from our Sportsman Brewing Company. In addition, 10 draught pumps offer a wide range of continental beers plus a range of traditional ciders, world bottled beers, various wines and spirits. Cheeseboards available all day, everyday and hot drinks. The Cricketers is a CAMRA award winning real ale pub situated in the village of Horbury. From Horbury head down High street, B6128, turn right onto Cluntergate and The Cricketers Arms is on the right. From Wakefield A642 turn right onto Cluntergate and The Cricketers is on the left. Or if coming from Huddersfield/Dewsbury on A642 turn left onto Cluntergate.